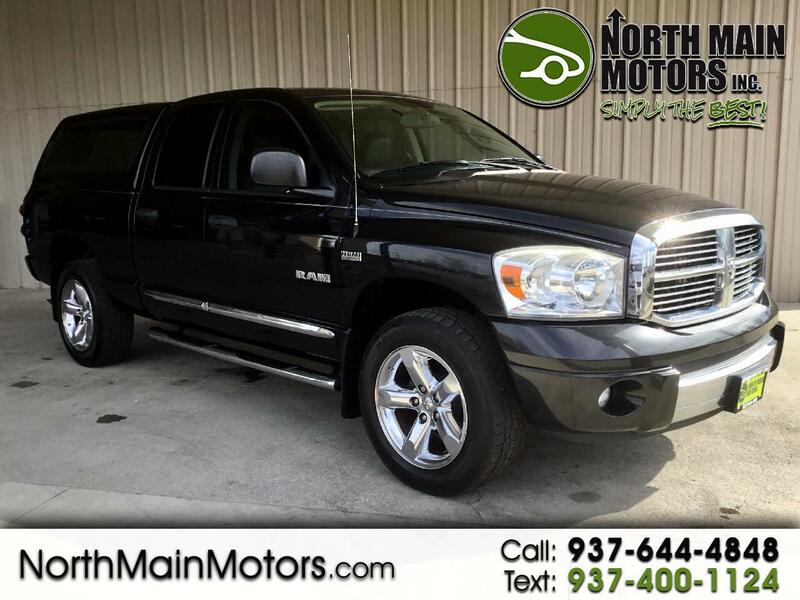 North Main Motors is proud to offer this wonderful 2008 Dodge Ram 1500 Laramie In Brilliant Black Crystal Pearl. This vehicle is beautifully equipped with Quick Order Package 26H Laramie, Trailer Tow Group (7 Pin Wiring Harness, 750 Amp Maintenance Free Battery, Class IV Receiver Hitch, and Heavy-Duty Engine Cooling), 20" x 9" Chrome Clad Aluminum Wheels, 3.92 Axle Ratio, 4-Wheel Disc Brakes, 7 Speakers, ABS brakes, Adjustable pedals, Air Conditioning, Alloy wheels, AM/FM Compact Disc w/SIRIUS Satellite, AM/FM radio: SIRIUS, Anti-Spin Differential Rear Axle, Auto-dimming Rear-View mirror, Auxiliary Transmission Oil Cooler, Bodyside moldings, Bumpers: body-color, CD player, Compass, Delay-off headlights, Driver door bin, Driver vanity mirror, Dual front impact airbags, Electronic Stability Control, Electronically Controlled Throttle, Folding Flat Load Floor Storage, Front anti-roll bar, Front Center Armrest w/Storage, Front Center Seat Cushion Storage, Front dual zone A/C, Front fog lights, Front reading lights, Front wheel independent suspension, Garage door transmitter, Heated door mirrors, Heated front seats, Hood Insulation, Illuminated entry, Leather steering wheel, Leather Trimmed 40/20/40 Bench Seat, Low tire pressure warning, Mopar Chrome Tubular Side Steps, Next Generation Engine Controller, Outside temperature display, Overhead console, Panic alarm, Passenger door bin, Passenger vanity mirror, Power door mirrors, Power driver seat, Power steering, Power Sunroof, Power windows, Rear 60/40 Split Folding Seat, Rear step bumper, Remote keyless entry, Security system, SIRIUS Satellite Radio, Speed control, Speed-Sensitive Wipers, Split folding rear seat, Steering wheel mounted audio controls, Tachometer, Tilt steering wheel, Tip Start, Trip computer, Variably intermittent wipers, and Voltmeter! From the moment you step on our lot until the time you drive away in your next car, your buying experience with North Main Motors is our number one priority. We encourage you to use the expertise and resources of our sales staff - they are here to help you find the right car at the right price. Call us today at 937-644-4848 to schedule your test drive!